Willard Parr Jr. is pictured at the North South All-Star football game during his high school days. Editor’s Note – The is the second in a series of four stories featuring the 2018 inductees into The Times-Gazette Highland County Athletic Hall of Fame. The inductees will be honored, along with 39 high school senior scholar-athletes, at a banquet scheduled for 6 p.m. Thursday, June 21 at the Ponderosa Banquet Center in Hillsboro. The public can reserve tickets for the event by calling 937-402-2522. Willard Ray Parr Sr. cannot explain where his son’s size or football talent came talent from, but he knows one thing for sure – the late Willard Ray Parr Jr. loved the game. “The only thing I can tell you is that he lived, ate, slept and drank football, and his idol was Bill Atsalis. He’s the one that got Will in college football,” Parr Sr. said. 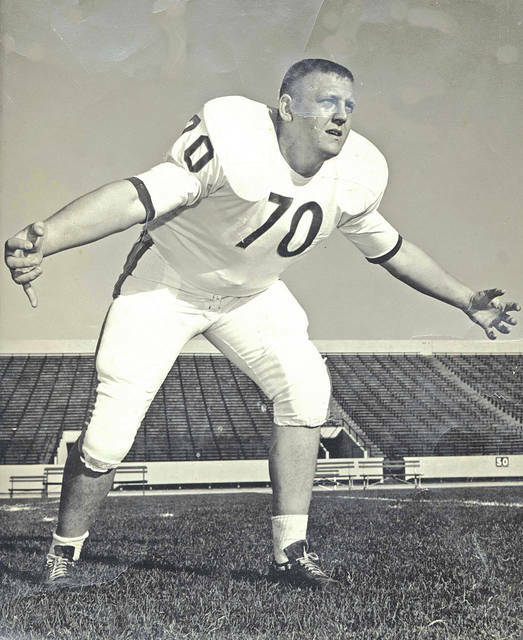 A 1963 graduate of Hillsboro High School, Parr Jr. went on to Ohio University where he was an All-American lineman. He was receiving letters from numerous National Football League teams and appeared destined for a professional career, but injured a knee late in his junior season and that ended his dream. “One of the big things I remember was when he made All-Ohio and went up to get ready to play in the North South All-Star Game in Canton,” Parr Sr. said. “We had said we better take his shoes along with us ‘cause he wore something like size 17, and when we got up there and went to the hotel lobby to register, they said they had everything he’d need all that kind of stuff. Then one of the coaches said, ‘How did he ever make All-Ohio as big and awkward as he is?’ Of course, that made me mad. Around that same time, Parr Sr. said he bought a new Thunderbird. “I put 160,000 miles on that thing driving to football games everywhere, even to Texas,” he said. Then one day during his son’s junior year at OU, Parr Sr. said he was in his basement painting when he got another phone call. It was Parr Jr.
Parr. Sr. said the only athletics he was ever played was a couple years of basketball at Belfast. He said that he lived in Hillsboro when Parr Jr. was born, but then moved the family to Miller’s Chapel Road and Parr Jr. started school at Concord Elementary in Sugartree Ridge. When the family moved back to Hillsboro, Parr Sr. said it was Atsalis that got his son involved in football. Parr Jr.’s oldest son, Jon Parr, said the family has several letters his father received from NFL teams seeking his talents. One of them was from the Dallas Cowboys, who Jon said his dad had his heart set on playing for. He said his dad played youth baseball, but besides that football was the only sport he played. Both Parr Jr.’s sons, Jon and Jeremy, were football stars at Hillsboro, and his daughter, Jill, was also a well-built all-around athlete. Jon said it was their dad that coached them as kids and beyond, got them interested in athletics, and pushed them to excel. After his football injury Parr Jr. returned to Hillsboro. He coached football at Hillsboro and East Clinton, was also a wrestling coach, and helped start the Seven Hills youth wrestling program in Hillsboro. He also officiated wrestling and umpired baseball at Shaffer Park in Hillsboro. “He loved the competition. You just remember so many good things about that,” Jon said. Parr Jr. passed away due to brain cancer in November of 1997. Bonnie said there weren’t many kids who did not like her husband. https://www.timesgazette.com/wp-content/uploads/sites/33/2018/06/web1_Parr-pic.jpgWillard Parr Jr. is pictured at the North South All-Star football game during his high school days.